Visit the Longdown Chicken Shack at Longdown Farm Shop for a wide range of feed, bedding and equipment for your poultry, plus a selection of eco-friendly housing by Solway made from recycled plastic. And, of course, chickens – usually Rhode Island Red Hybrid Warrens, which are friendly, easy to keep, and are excellent laying birds. Other varieties are often available. Local farmer, Bryan Pass, has an excellent reputation for animal sales, and in particular his knowledge, advice and after-sales service on chickens is well-known among local chicken-owners and is in high demand! Bryan and Farm Shop manager Wayne have created the Longdown Chicken Shack as an add-on to the Farm Shop at Longdown. 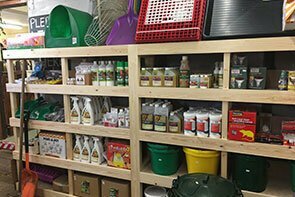 The stock contains excellent quality feed and equipment for small animals and poultry (with an emphasis on chickens), which can be bought online* or instore at competitive prices. *bulky items for collection only. The one-stop shop for your poultry needs! Sign up to our Poultry News e-newsletter here. View Farmer Bryan’s new book ‘Chickens In Your Garden’ here.